Continuity errors have always bothered me. Historical inaccuracies, too. When I was a senior in high school I did my IB Extended Essay (a 4,000-word paper) about the issues in the Disney movies Davy Crockett and Pocahontas. So, when I watch a new episode of television and some character does something that makes no sense because of previously established facts, I get upset. This also happens when I see a rerun and pick up on something that I never noticed before. Well, Stephanie suggests that they could put a drop of red nail polish on one of their backs. Apparently, this is what she did with her turtles (and might have been a good idea, considering that Jesse does mix-up the boys in the very next episode, "Nicky and/or Alexander"). 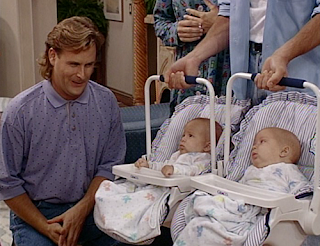 Problematically, there are no turtles on Full House. Aside from Comet, the dog, the family only has Michelle's fish in an episode and later her donkey for an episode. What turtles is Stephanie talking about? ?